Grab your favorite pen and relax with your journal. 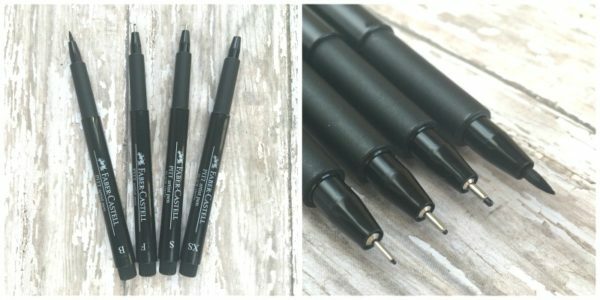 Not sure which pens are best for bullet journaling? I’ve got you covered! When you start your first bullet journal, the flood of information can be overwhelming. Especially when it comes to choosing pens, notebooks, and other supplies. Everyone wants the “right” supplies. The truth is–and I hope I’m not the first to tell you this–supplies don’t make you more effective. Your mentality does. I’ll admit I’m a weak creature wooed by velvety paper, smooth ink, and rich pigments. Investing in a fine notebook and pen helped me commit to the process. But choosing does NOT have to be stressful or overwhelming. Here’s the deal, guys… You can’t go wrong with a good notebook, and a quality pen. Those are the only true essentials in bullet journaling. Bam! I just solved all your problems. Ok, not quite. But you dropped by my place today because you want to know which pens will dance across the page of your journal like Snoopy on ice. I’ll make it easy for you. You can’t go wrong with any of these! They’re good quality, reliable, and they make writing in your journal a joy instead of a task. I like you guys too much to recommend a product I have not personally tried. There are so many great options out there; I can’t try them all, and you shouldn’t either. I don’t want you to waste a lot of time and money on trial and error. The pens on this list are a safe bet. I’m listing these together because I’m not convinced they’re different pens. Sharpie fine pens are my workhorses. They’re affordable enough to keep four or five in my purse, so I end up reaching for them a lot. When I spotted the Sharpie Art Pens, I thought, “Cool, new pens!” They got me. I’m pretty sure they are the exact same pen with different packaging. So, take your pick. *They’re not permanent markers; they don’t bleed through like a regular Sharpie, but your writing will be bold and smooth. I’ve always had a soft spot for Paper Mate products. Inkjoys were my favorite pens throughout high school and college, so I was more than willing to give Flairs a try. Great value for the money. I feel they’re underrated in the journaling community. There are different thicknesses available; I favor ultra-fines, which are harder to find (of course). If you like a dark line, you can’t beat Faber-Castells. They’re top quality artist pens, and you’ll feel the difference on paper. The manga packs come with four sizes to choose from. They’ve kind of spoiled other pens for me! 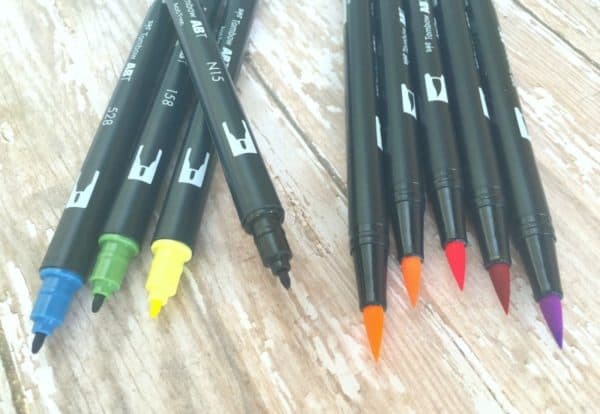 I love these as an alternative to the Faber-Castells, and they’re a little easier on the pocketbook. 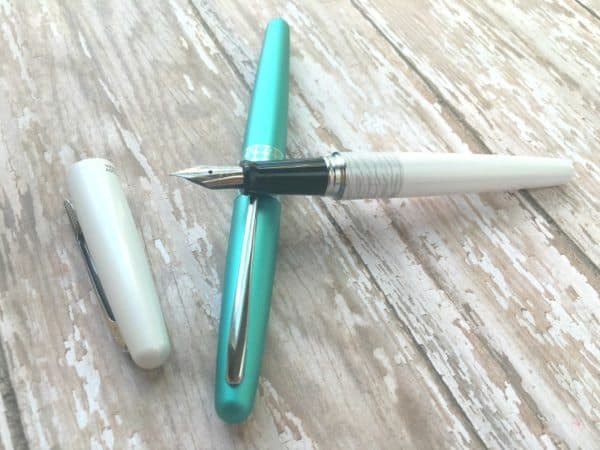 The Metro is an affordable fountain pen for people who like an easy writing experience. It’s one of my all-time favorite pens. If you like to write long sections in your journal, a fountain pen can be easier on your hands. Especially handy for cursive writers. You can get it at Amazon, J*B Welly (my favorite place to grab notebooks), and a few other places online. I warn you, though, it’s a gateway pen. There’s no end to that rabbit hole. Don’t, whatever you do, look at Goulet Pens and all their beautiful jewel-colored inks. Don’t get excited and drool over all the amazing pens on their site. Ok, fine, go ahead. Just don’t say I didn’t warn you! Once you have a solid routine down with your everyday pen, you might choose to add embellishments. 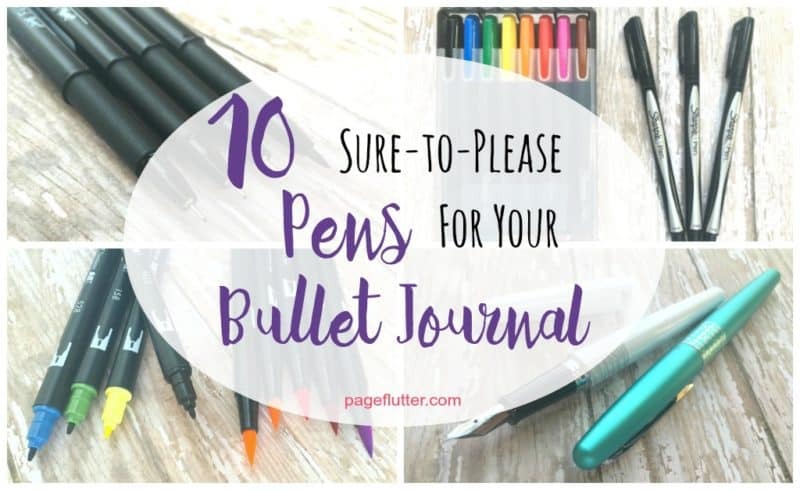 The next few pens won’t be your primary writing pen, but if you like to dress up your bullet journal they can make life a little easier. You won’t catch me pretending I have any talent in the hand-lettering department. I mean, I try, but I also don’t mind leaving the high notes for the sopranos. Know what I mean? One of the leading ladies of hand lettering, Dawn Nicole, demos these tiny brush pens quite a bit. Even with my limited talent, I find these easy to use for headers, hand-lettered quotes, and small embellishments. They come in two varieties: hard and soft tip (I’ve linked to a combo that includes one of each). I prefer the soft tip, myself. These markers don’t need any introduction. Tombow Dual Brush Pens are a great option for hard-core decorators. If your bullet journal is covered in colorful hand-lettering and doodles, these belong in your bag of goodies. Who am I kidding? If you’re a hard-core decorator, you already have the giant set of these! When I need to add color to my journal, my fineliners are my fallback pens. They write smoothly on the paper without bleeding to the other side. *These are not the same as Staedtler Rollerball pens. They look identical, so you need to pay attention to the labels. I used rollerballs when I first started bullet journaling (and I still like them for letter writing), but they bleed through my journal much easier than the fineliners. Trust me, if you’re journaling, you want the fineliners. 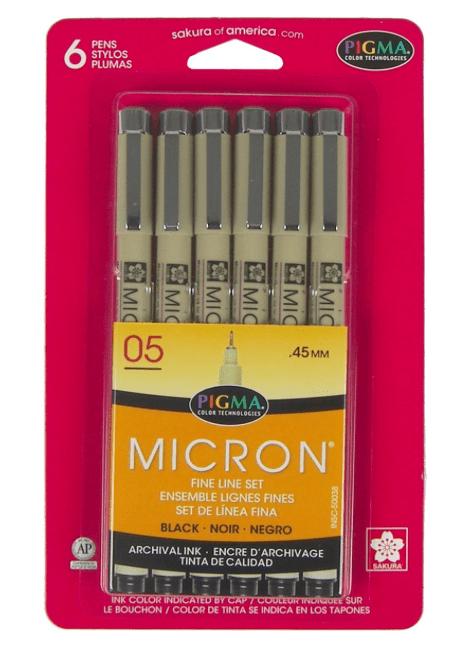 Pigma Microns come in different thickness, and you can find packs of all-black or different colors. They’re high quality art pens, much like Faber-Castells. I find the colored ones write much like Staedtler fineliners, but again, you can get them in different thicknesses. Unless you do a lot of sketching, I’d stick with 03-05 tip sizes. 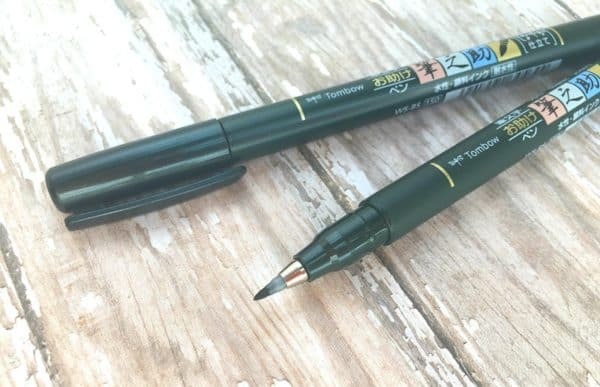 Again, these are very similar to Staedtlers or Microns, but some people swear by their LePens (Hi, Mom!). If I swatch all three brands on a card together, I can barely tell which is which. I say go with your gut; you won’t be disappointed. 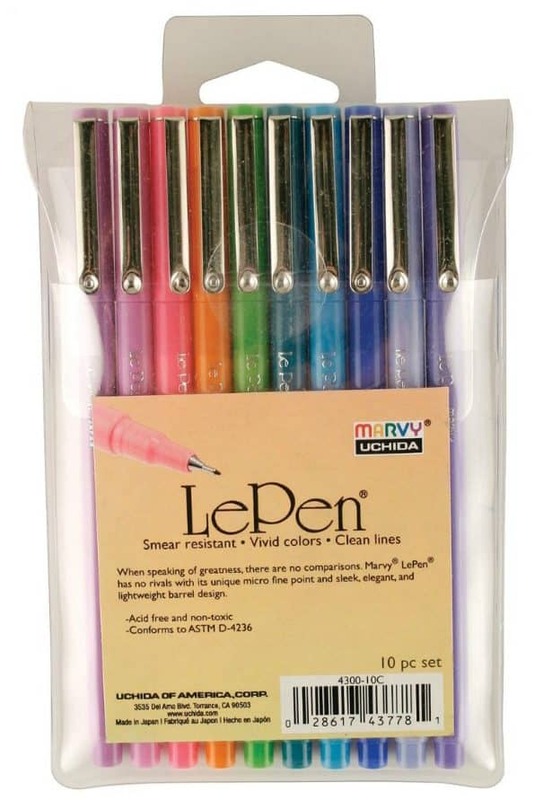 Le Pens are available in color multipacks and plain black if you want to use them as your everyday pen. So, are you overwhelmed yet? Don’t be! Deep breath. My advice is to start with one of the good everyday writing pens I’ve listed. Once you get the hang of things, you can add colors if you need them. Starting a bullet journal shouldn’t be a big production. Let your system drive your supplies. Some people flourish when they color code the world, whereas others are more efficient in black and white. Don’t try to force your journal to be like someone else’s. It’s you. It’s your life. Be you! 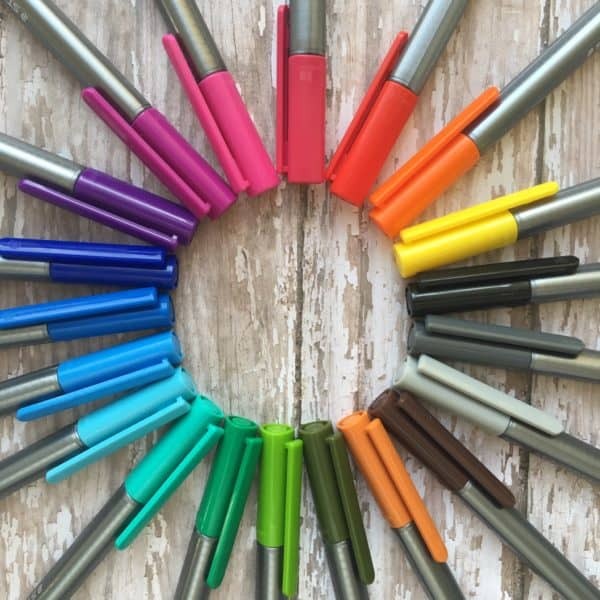 Have you tried the pens on my list? Let me know which ones you loved, which ones let you down, and tell me about your favorites that didn’t make the list! Subscribe to my newsletter for Page Flutter updates, posts, and giveaway previews. One nice thing about the Pigma pens is that they are acid free and you can use them in other crafts. Quilters use them for making labels and mimicking the look of india ink calligraphy that was used on (US) Civil War Era quilts. Great tip, and thank you for sharing! Microns are fantastic pens, and I don’t think anyone could be disappointed in them. 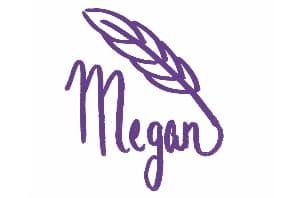 Sakura Microns – different sizes and colors, these are also fantastic for Bible journaling. acid free and all that. 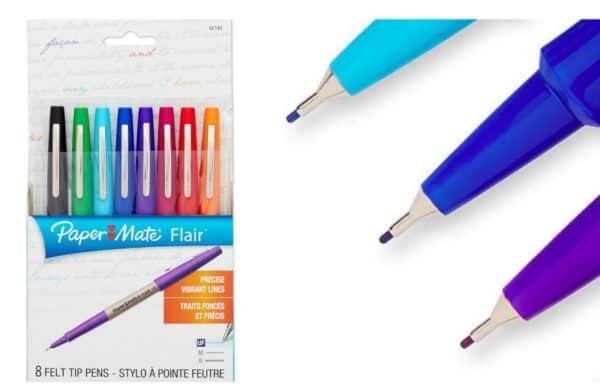 PaperMate Flairs – i use the medium and have about 20 colors. I also have the ultra fine that I wish very badly would come in all the same colors. Plus I need a teal. Why is there no teal? My pride and joy though is my Pilot Metropolitan Retro in turquoise. I. LOVE. THIS. PEN. Right now I am using cartridges, but those Goulet guys & gals tempt me with a converter and a bottle of ink. Gateway pen, indeed. And yes the Goulet Pen site is drool worthy. They know their stuff. 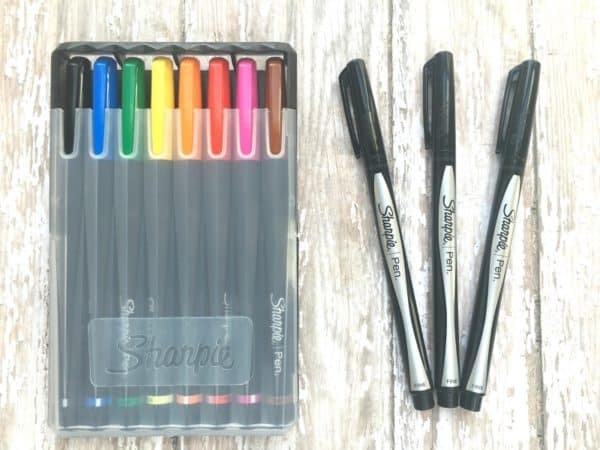 Thanks for the tip on the Sharpie pens vs. art set. I’ve been thinking of snatching a set of those too. I definitely have a soft spot for the Flairs. Even though I felt a little duped by the Sharpie re-packaging, they’re still a great set of pens, and I use them with glee! Thanks for sharing your favorites with me. ???? I have received it and love it. I now have a relapse of Fountain Pen Fever. I might never recover. Thanks for the article, MJ. Just wondering your advice on a good gel pen? I thought I loved the Uni-ball Vision, but for some reason all of a sudden they are starting to skip on my Rhodia Webnotebook. 🙁 I have some Energels on order through Amazon and hoping that I will like them. Also, I don’t hate the G2 pens, but I wanted something a bit darker. Hi, Ted! Sorry about the late reply, but I have been searching and searching for an alternative pen for you. I don’t generally use gel pens in my journal, so you stumped me with this question. Well done, you! I do use gels for note-taking, though, and I’ve always liked the G2. The Uni-ball Vision would have been my next guess for you (no help there). Other than that I’d go for the Uni-ball Signo or Stablio Color Gels. Please, let me know what you think of the Engergels (I haven’t tried them yet). Gosh, I wish I had a better answer for you, but I won’t waste your time by recommending anything I haven’t tried or don’t like. Best of luck! Hi M.J. 🙂 Please don’t apologize…I appreciate your response and taking the time to help! I am enjoying the Energel so far…seems not to skip and has a strong, steady flow. It may be one you consider trying. You’re so welcome! No need to be intimidated by fountain pens. Get one that takes ink cartridges and you’ll be surprised at how easy they are to use. You just pop the cartridge in and go! Pilot Metro and Lamy Safari tend to be the favored entry pens, but there are so many great choices out there. But you may want to stay away from anything that says “flex nib” for your first fountain pen. Good luck and keep me posted!